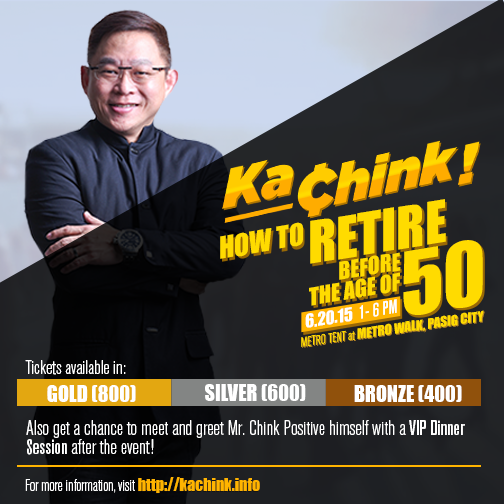 Sought-after finance expert and wealth coach Chinkee Tan gives a powerful seminar dubbed as "Ka-Chink! 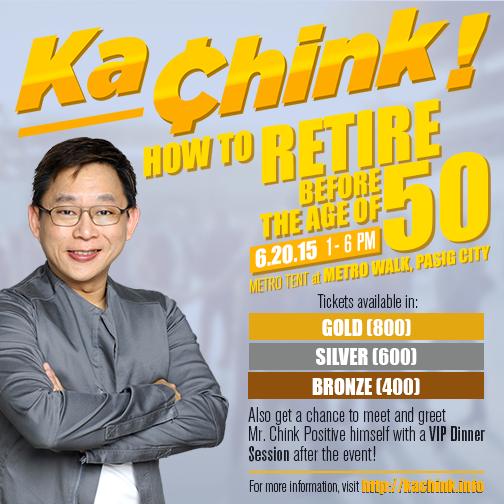 How to Retire Before The Age of 50" happening on June 20, 2015 at 1-6pm at Metro Tent, Metro Walk in Pasig City. This seminar will empower us to create, handle, grow and protect our wealth, as well as to become financially free and debt free. Chinkee Tan inspires every Filipino every Sunday morning on his radio show on 92.3 NewsFM, “Chink Positive!”, the 20th KBP Golden Dove Awardee for Best Special Program. As a Wealth Coach and Motivational Speaker, he averages 240 speaking engagements per year giving talks on building self-esteem and giving success tips, effective speaking skills, entrepreneurship and selling skills, leadership qualities, and effective financial management. Tan is also the author of 6 best-selling books on finances, wealth management, positive lifestyle and prosperity that sold over 300,000 copies combined. You can never WIN in LIFE with a defeated MINDSET. GET A CHANCE TO HAVE AN EXCLUSIVE 5-COURSE DINNER AFTER THE EVENT WITH MR. CHINKEE TAN. REGULAR RATE is @ P1500 but NOW AT ONLY PhP1250 on limited slots only. Know How To Create Money Just Like The Taipans & Tycoons. Learn the10 Effective Ways On How Create More Income Without Leaving Your Work. Learn How To Save An Extra P28,000 a Year Without Increasing Your Income. Learn How To Create A Rock Solid Budget. Learn How To Shop For The Things You Want Without Destroying Your Budget. Learn When To Buy A Home or a Car. Learn the In’s & Out’s of Investment. Learn How To Invest Like Warren Buffet. Learn How To Earn Income While Your Are Sleeping. Learn How To Much Money Do You Need For Your Retirement Fund. How To Protect Your Retirement Fund From Running Out. How To Protect Your Family’s Finances. How To Leave Your Family a Monthly Residual Income Even If You Stop Working.